As mentioned yesterday, Sunday was decided by our lovely local hosts to be a day of rest. After another night of low single digit hours of sleep, we woke up to a marvelous sunny day. Ippokratis was excited to finally have the chance to use his recently purchased walking boots in their natural habitat and Haider had to suffer the indignity of having to wear one of Ippokratis’ jumpers which are two sizes too small as he omitted to bring one of his own and our guides insisted that it might be cold where we were venturing. After another beyond belief journey on single track roads masquerading as four lane highways, draped in spaghetti like formations over the peaks and gorges, with cars on both directions squeezing inch (im)perfect through narrow passes where even grey bearded goats would have thought twice to pass and with no seatbelts we arrived 3 hours later in Raybong at 2,500m. 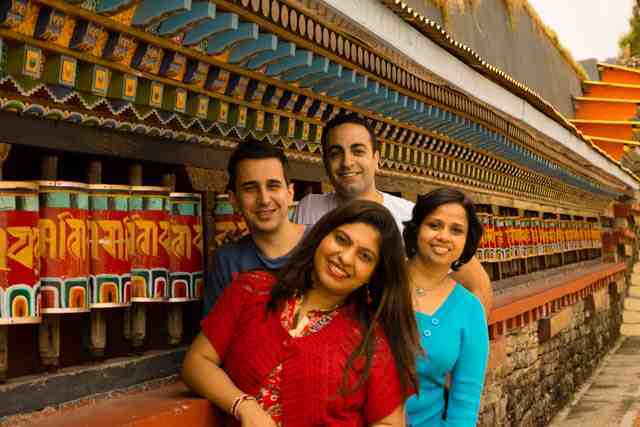 There we visited a lovely Budhist monastery framed by the imposing backdrop of Mount Kanchenjunga and where the Dalai Lama had just visited, 10kms from the Tibetan borders. 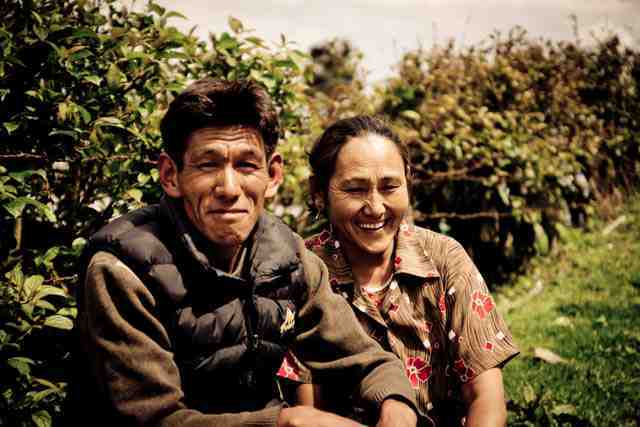 Another hard drive followed to Namchi in South Sikkim, but the vistas compensated for this in abundance. 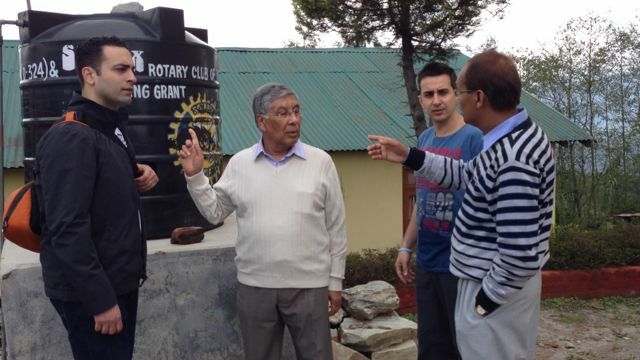 There our rotary hosts took us to one of their local projects and explained to us how they are providing safe drinking water for the wider area. We had a brief stop over at the neighboring guesthouse and we were offered tea by the locals. 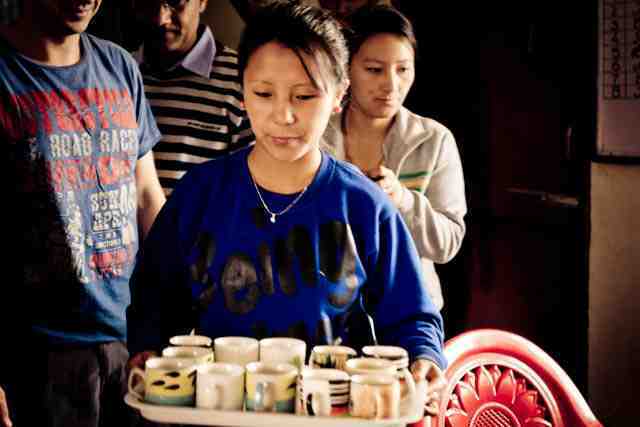 Although most of us were debating the wisdom of drinking the warm chai served to us, we gave in and sampled what must undoubtedly be among the best cups of hot drink we have ever drunk. 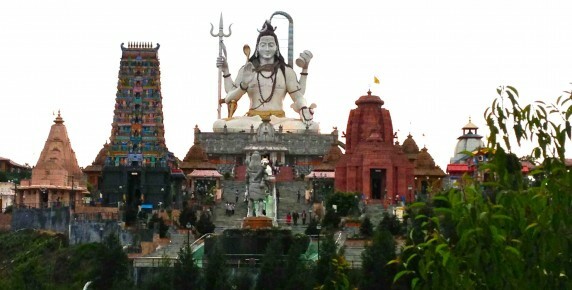 The rollercoaster journey continued to Solophok, where we visited the magnificent temple of Siddheshwara Dham. This is unique in that all styles of Hindu temples are represented among the sprawling complex of buildings. The return journey was another few hours of brain-against-skull bashing bumps. And if we thought that the morning was terrifying, we were certainly not prepared for the simultaneous addition of rain and fog, and the concurrent removal of any light bar the blinding headlights of the oncoming traffic. To keep us occupied, Haider, Ippokratis and Dr Basu (the CALMED programme director) spent the majority of the journey discussing future strategy for development and funding of our various projects. We have some exciting new ideas and plans and we will be sharing these with you over the months to come as they take shape. 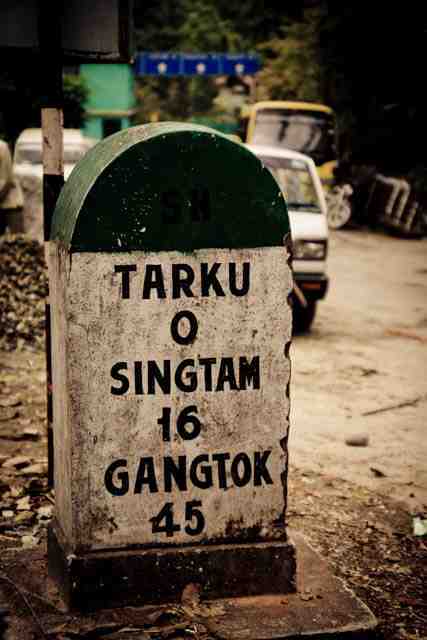 Needless to say, we arrived safely back at our hotel in Gangtok. This has been anything but a day of rest, as we have all returned exhausted and battered from our 12-hour trek round Sikkim. Nonetheless, it was an experience not to be missed and we are very grateful for the hospitality, time, effort and generosity of our lovely local hosts. The training recommences early tomorrow and we will continue with the updates and pictures.